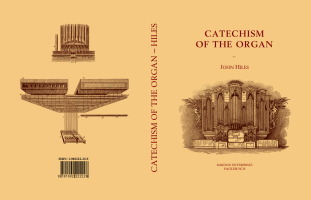 Description: This book outlines in question and answer format ; the construction, history, and the playing of the organ ; it also describes the various organ stops, and contains a number of specifications of organs in Germany, England and France. Hiles, John. Organist in Shrewsbury; of St. Thomas’, Portsmouth, 1853-a1859; in Brighton; London. Composed piano pieces, songs, &c. Wrote books about music. Brother of Dr Henry Hiles. bap. Shrewsbury, England, Dec. 30th, 1810; d. Kensington, London, Feb. 4th, 1882. I. Of the organ in general. III. The interior of the organ. IV. Of the pipes and their constituent parts. Measure, or scale, of the pipes. VI. Of the manuals and their connexion with the wind-chest. VII. Of the registers, or stops. VIII. Of the bellows, wind-trunks, and their connexion with the wind chest. IX. Of the stops of an organ, and their character. c. The stopped, or covered, pipes. d. Flue-work stops of peculiar and distinctive character. e. Flue-stops, of various lengths. X. Descriptions of various english and foreign organs. XI. Upon the characteristic differences of the manuals. XII. Of the art of registering. XIII. General principles about playing on the organ. XIV. Upon the pneumatic lever ; or, the pneumatic work. XV. Upon intonation, temperament, tuning, and the sounds of the organ. XVI. Upon defects or interruptions in mechanism, and their remedy. XVII. Upon the origin of the organ, and its history.